Today’s BITMAPS will chronicle the Borderlands launch party thrown by Gearbox Software at the Granada Theater in Dallas on October 17, 2009 – in photographic form. It was a great party full of cool people and awesome music – big thanks to Gearbox for throwing an awesome shindig! I don’t know about you, but this is the first time I’ve seen a video game on a marquee. The crowd outside the Granada was cordial and cigarettey. One of these things is not a statue. Some shots of the crowd. Gearbox had a huge demo station set up so visiting gamers could try out the game days before its release. Lots of explosions and experience to be had. Here’s a collage of three guys caught playing. Three more fellas. 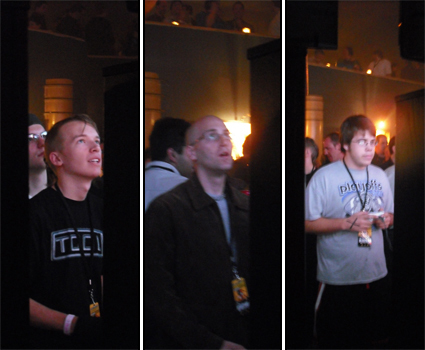 I love the expression of the guy on the left – that’s the face you want to see on someone playing your game. Midway through the evening, four dancers took the stage and presented this obviously Borderlands-themed dance. HOLY CRAP IT’S ALIVE. At least my terror was short-lived. …to introduce Gearbox President Randy Pitchford! He chatted for a bit about Borderlands before showing a launch trailer unfortunately killed by a lack of sound. Nothing goes right when Powerpoint is involved. Mr. Pitchford’s speech lead to DJ extraordinaire Mix Master Mike taking the stage and positively tearing down the joint. Mix Master Mike doing what he does best, DROPPING A BEAT. Things got quite a bit livelier once Mix Master Mike took the stage. And even livelier once this terrifying fellow took the stage. And yes, he eventually did the worm. He even came down into the crowd to mix it up a bit. And quickly found a dance partner. Where he proceeded to dance the night away. All in all, a great night for games and two free drinks. Thanks again to the folks at Gearbox, and I’m already looking forward to their next game’s launch party.